This page is a repository of Transbay Blog transit and track maps. 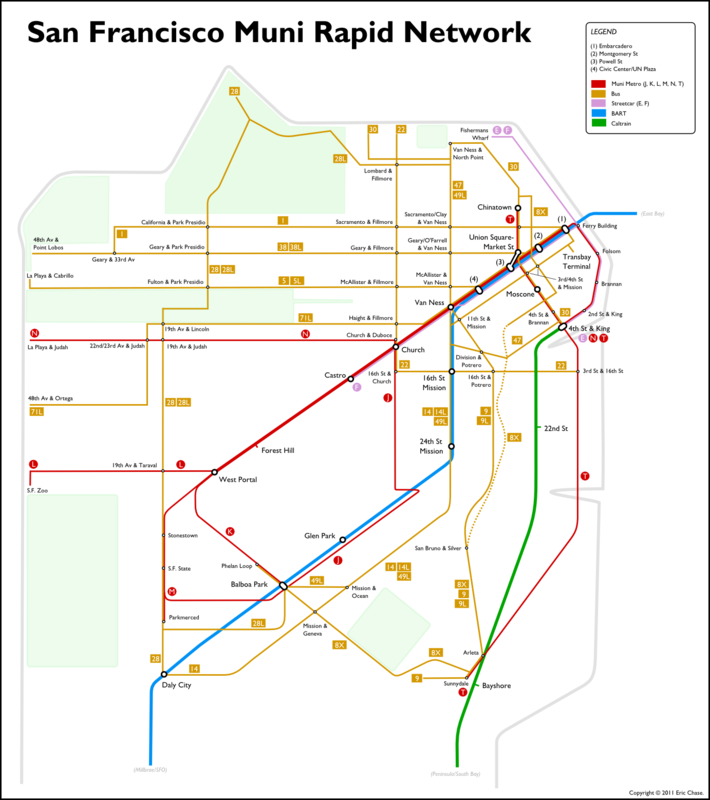 This map depicts the bus, light rail, and streetcar routes that are collectively designated as San Francisco Muni’s “rapid network.” These are the most popular and frequent routes — together accounting for 75 percent of Muni ridership — and are slated for future improvements under SFMTA’s Transit Effectiveness Project. 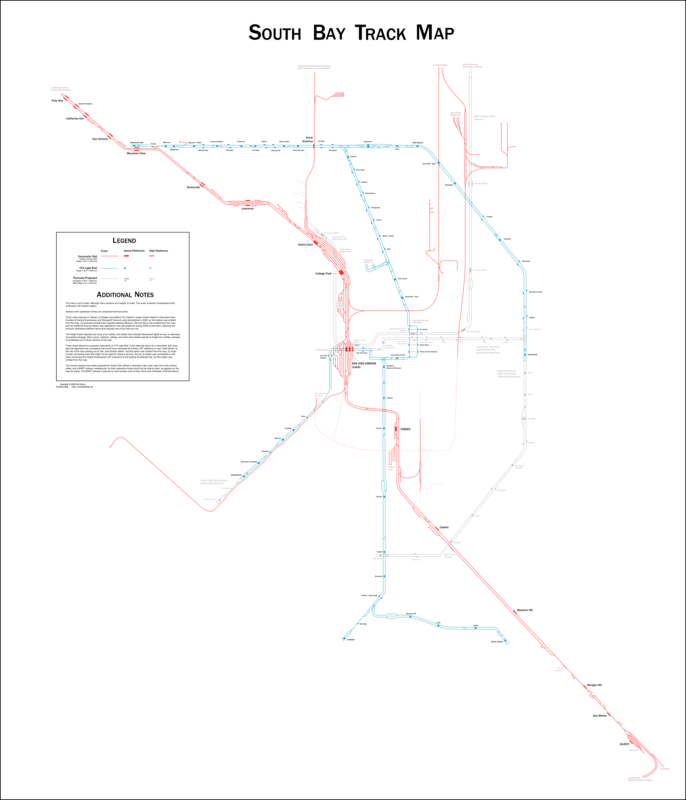 For completeness, the map also includes BART, Caltrain, and the Central Subway project now under construction. BART is the Bay Area’s primary heavy rail system serving San Francisco, Alameda, Contra Costa, and San Mateo Counties. 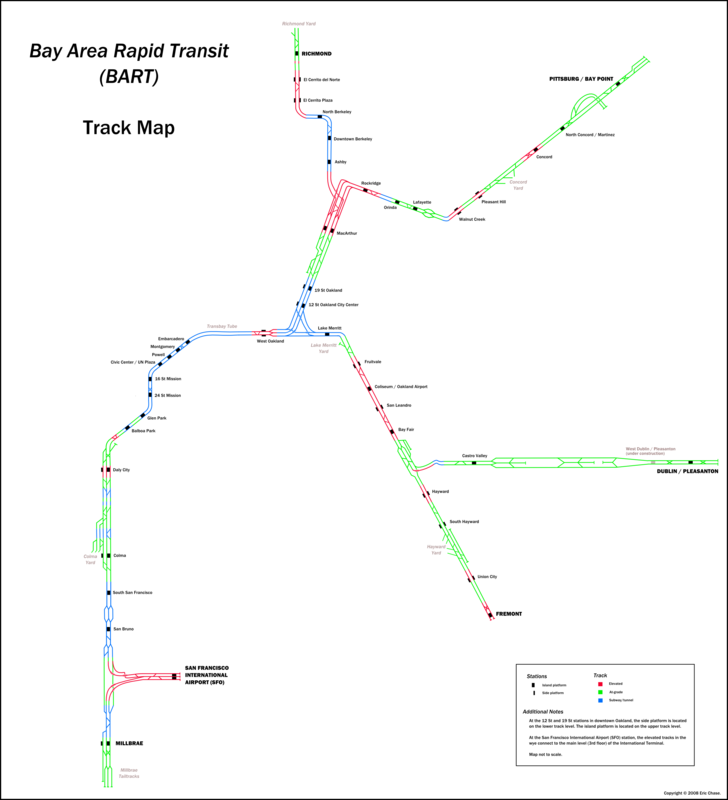 BART tracks are broad gauge and grade-separated, and this map includes only BART tracks. Tracks are color-coded according to whether alignments are elevated, at-grade, or subway. An under-construction infill station at West Dublin/Pleasanton has been marked on the map, and a future version of the map will include proposed system extensions. The South Bay/Santa Clara County map includes track for commuter rail (Caltrain, Altamont Commuter Express, and Amtrak/Capitol Corridor), the light rail system operated by the Valley Transportation Authority, and also select freight track. The map also marks in light gray certain proposed and planned extensions: in particular, light rail extensions and BART to Silicon Valley. This pair of maps drawn in December 2014 depicts two alternatives for reactivating the Long Island Rail Road’s (LIRR) Rockaway Beach Branch in Queens for passenger rail service. The first map is a service schematic that depicts the branch integrated into the subway system via a new tunnel connection to the IND Queens Boulevard subway line. The second map is a track diagram that restores LIRR commuter rail along the corridor to a new terminal station at Aqueduct, where a transfer to the A train would be available.